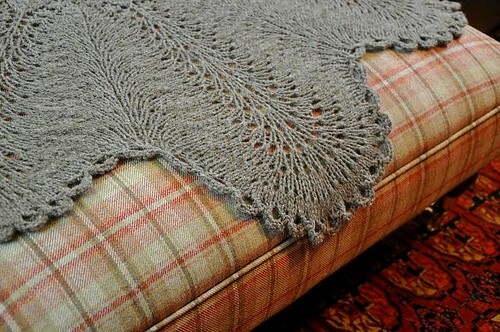 Notes: I have loved every moment of making this blanket. 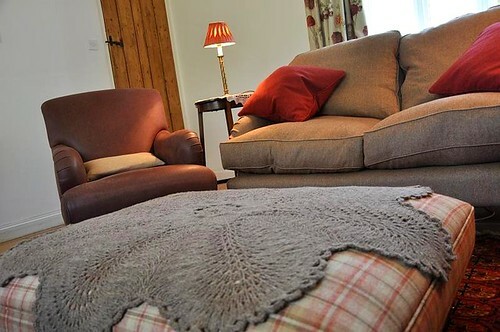 It has kept me warm in the chilly Spring evenings, has felt comforting on my lap and has been easy to knit. It took a fair amount of blocking to transform the blanket from it’s original crumpled state to the smoothed-out version you see here. Worth it though. 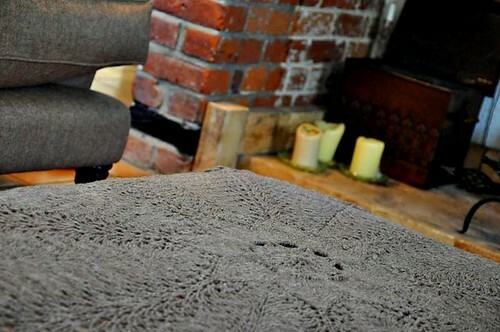 I love it when both the process and the outcome of a knitted project work as well as this! I don’t have much to show for knitting this week. My Hedera socks are coming along nicely, I’m almost down to the heels now, and as I’m knitting them both at once I’ll be wearing them pretty soon! 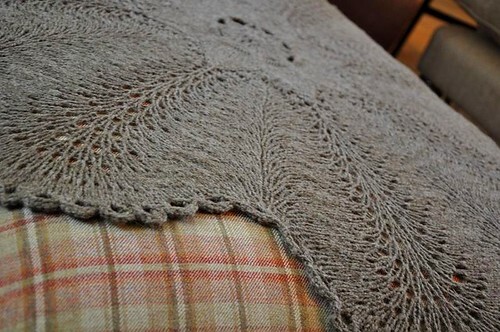 The Hemlock Ring blanket that I’m working on is a joy to knit in the still-cold evenings. It’s warm and cosy to have on my lap, and requires almost no concentration at all! Instead, I thought I’d fill you in on a couple of other things I’ve been up to. My day started with a Laura Mercier makeover (not something that I do often!) The makeup artist put a LOT more makeup on me than I would normally wear, but she did have some really good ideas. I swear that they use four times as many products as you would yourself just in the hope that you buy something! Afterwards, I went to stock up on a few essential oils, and discovered that the store’s massage therapist was offering a massive discount on aromatherapy massages. I must point out that this kind of spontaneous self-indulgence is really not the norm for me, but I managed to overcome that obstacle, and had a massage straight away! 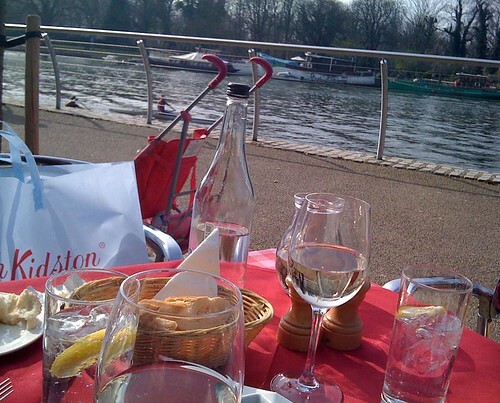 After that I met Steve, and we had a lovely lunch together at a French restaurent next to the river Thames (photo above). It was the most fabulously sunny, warm spring day, and the river was full of rowers and canoeists. Wine was drunk, and our noses turned a little pink (in the sun, you understand…). …but I should probably point out that the pushchair is nothing to do with me. Honest. In other news, the yoga foundation course that I’m on ends soon, and I’ve been trying to decide which teacher training course to sign up to. Turns out it’s a bit of a minefield. There is a UK governing body of yoga who claim that any training course not accredited by them is not ‘proper’ training. And then there are interational yoga schools, such as the Sivananda centres, who have been training teachers for forty years and have no desire to be accredited by the British Wheel. The Sivananda training really appeals to me; it’s the type of yoga that I love practising the most. But I need to figure out whether doing their training might inhibit the possibility of teaching in the UK. If you have any experience of this area, I’d really love to hear your views! Last year I signed up for Sundara‘s Season’s Yarn Collection. One of the yarns I received was a skein of Sock yarn, in Night Blossom. This yarn is a very beautiful deep, almost black purple, with flashes of reddish-pink and purple highlights peeping through. 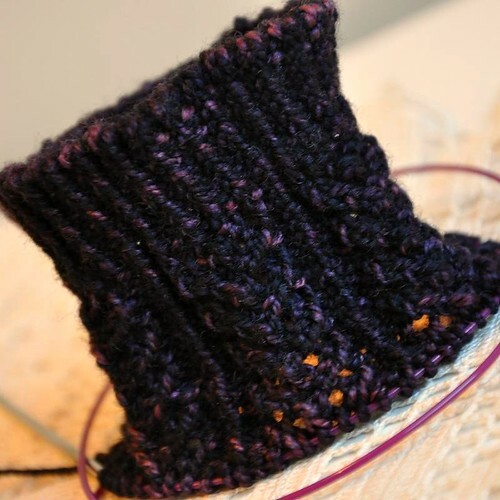 I thought it would look good as a lacy sock – probably a legacy of my time as a goth; my love for purple and black lace remains undiminished, if somewhat less requited now than in those dark, dark days! 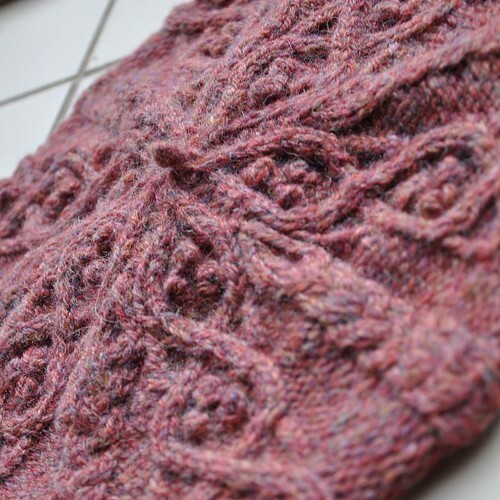 I found a pattern I liked, Violets Rising by Anne Hanson, which I started knitting a few days ago. However, I think the pattern needs either a totally solid yarn, or one that is lighter in colour than this one. And I think this yarn needs a pattern that stands out a bit more against the dark colours. So, I started again, this time with Cookie A.’s Hedera pattern. 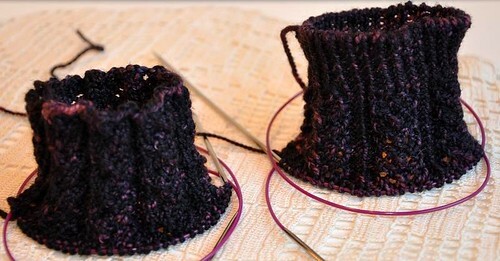 The Violets Rising sock is on the left, and the Hedera one is on the right. I think the lines of twisted rib that go down the Hedera really help to separate and delineate the lace sections, and make the whole pattern easer to read. 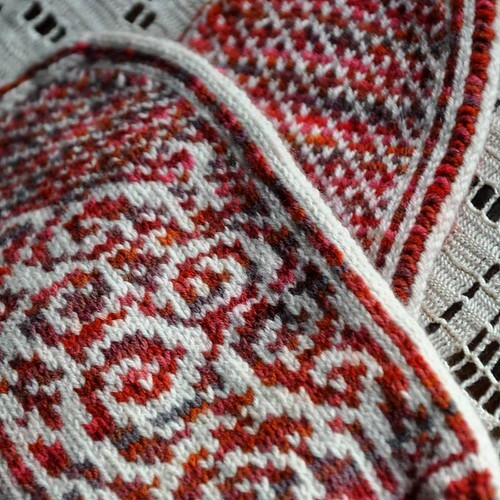 So, I’ve frogged the first sock and am now working on two Hederas at once. I’m thinking these will be great to wear with my black yoga pants! 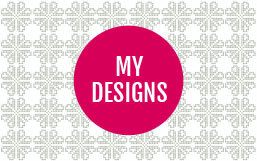 … via the link on the designs page (menu on left). 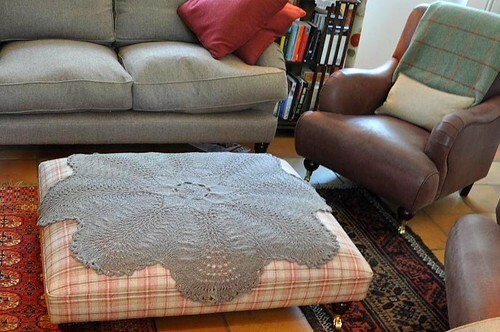 Or you can store it in your Ravelry library by going to the pattern page here. Enjoy! 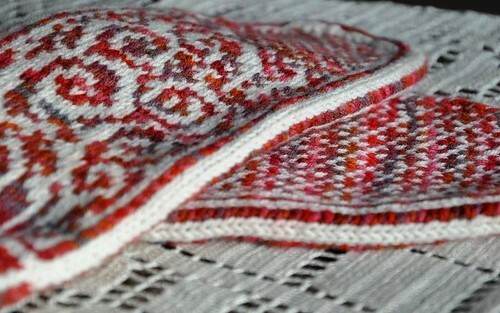 Pattern: Anemoi Mittens, by Eunny Jang. Yarn: Posh Yarn Lucia, in Fairground and Natural. Modifications: I altered the fingertips and cast off – you can see what I did here. I reversed the dark/light colour combination from that charted. The thumbs are slightly longer than in the pattern. Other than that, I followed the pattern exactly as written. Notes: I used the Italian tubular cast on method which gives a decorative, corded edge. For a more detailed picture, and a link to a great photo tutorial on this method, click here. 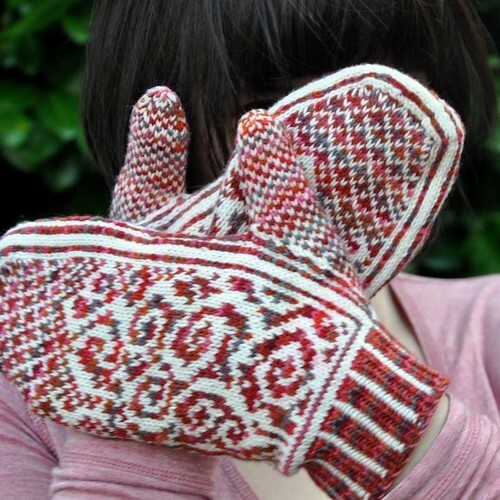 I loved making these mittens. They were quick and fun, and the pattern was well written and clearly charted. The yarn was delightful; I am really happy with how the white yarn highlights the beautiful Fairground colours. They are yet another example of why I like variegated yarn so much more when it is spliced with white!